Retrieve on the ground and retrieve over high/bar jump with formal presentation. After cueing a retrieve on the ground, ending with a formal retrieve presentation, the team will perform a retrieve over a high jump with a formal retrieve presentation. Purpose: Demonstrate retrieve skills in different contexts with formal completion of exercises. Equipment: Retrieve object, high/bar jump (height is handler’s choice). Exercise set-up: Handler starts with dog in heel position. The exercise begins when the handler gives the dog a single cue to stay, throws the object at least 20 ft. (6 m) forward and gives a single cue for the dog to retrieve. The dog should go directly to the object, pick it up and return directly to the handler in either a formal front or directly to heel position. After a 2-second pause, the handler will take the object (verbal release cue is optional), which ends the first portion of the exercise. The team then moves to set up for a retrieve over a high or bar jump. The dog must move with the handler but does not need to be in heel position. The second part of the exercise begins when the dog is given a single cue to stay and the handler throws the object over the jump. 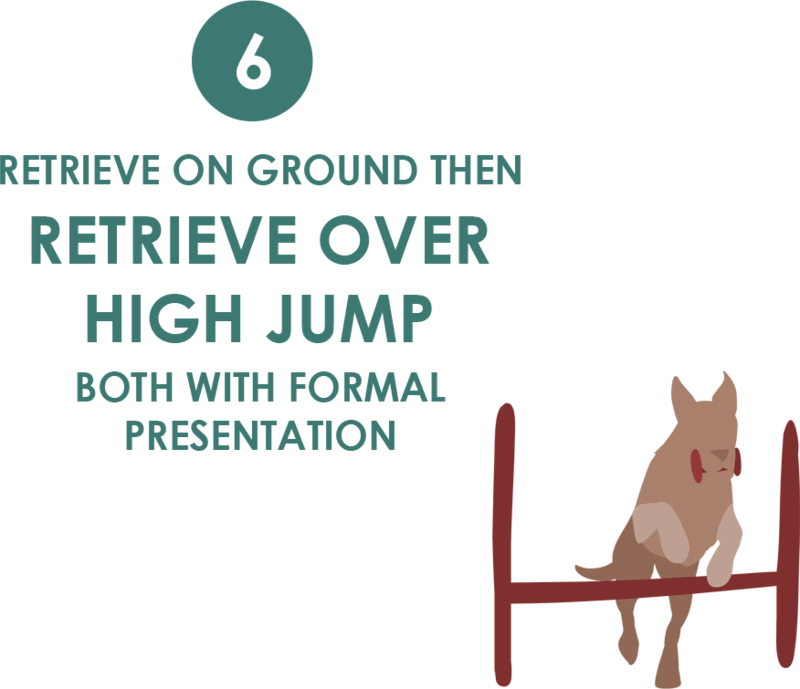 After a 2-second pause, the dog is then given a single verbal OR signal cue to retrieve over the jump. The dog must jump in both directions and return with the object. After a 2-second pause, the handler will take the object (verbal release cue is optional), which ends the exercise. The formal front or heel position must be the same for both retrieves. Non-qualifiers: Dog fails to retrieve on the first cue. Dog fails to take the jump in both directions. Dog drops the bar (if a bar jump is used). Dog drops object before returning to handler. Dog does not return directly with the object. Handler does not wait 2 seconds before sending the dog for the retrieves or before taking the object after the retrieves. Video does not permit the exercise to be adequately judged.